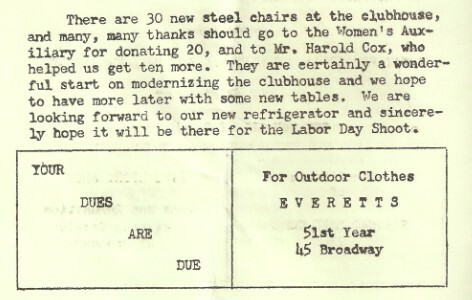 September 19th: Work Day at the Club. October 1st: Regular Members Meeting 7:00 pm. All are welcome. There will be a guest speaker on invasive species!!! Presidents Corner Thank you to all that made the 10 Gun Raffle and Picnic a success. Congratulations to all the winners. The trap range has been shut down. Please do not do any trap shooting at the club. Sorry but that is how is has to be for right now. We will be having a work day at the club on September 19th. All are welcome to help; we have lots to do before winter. Sporter Rifle: Practice will be September 21, at the inside range. Official shoot starts September 28th. All are welcome bring down your .22 rifle and join the fun. Pistol League: Shooting every week, if you want to join then show up on Tuesday evenings, you must have a pistol permit to shoot. Trap Range: Has been suspended until further notice. Club T-Shirts: We will be taking orders for club t-shirts, they will be grey with our club logo on the back and our club name on the front. The shirts will sell for $18.00 each, if you need a 2 Xl or largerthey will sell for $20.00 each. I will be taking orders in advance so please contact me with your sizeand if you want your name printed on the front it is another $2.00.We will not be ordering these in quantities for if you want a t-shirt you must call me: Cecilia-518-201-4009, please leave a message if I don�t answer, I will need your name, t-shirt size and if youwant your name on the front as well and how it is to be spelled. Trudeau Big Buck Contest: See Claude at the Blue Line to sign up for the Trudeau Big Buck Contest. There is a sign up sheet for the Youth Hunters this year !!!! TREE SEMINAR -On Friday, September 11, Edward Kanze, a New York State licensed guide, expert naturalist and author provided a tree identification seminar. All attendance applauded Edward for his ability to convey interesting and relevant information on over 32 species of trees. Mr. Kanze was presented with a honorary club membership.